This is one of my family's favorite meals. It is an easy thing to have prepped in advance. Make the meatballs the night before or morning of ... and everything will come together quickly at meal-time. The meatballs can, also, be made in advance and frozen. 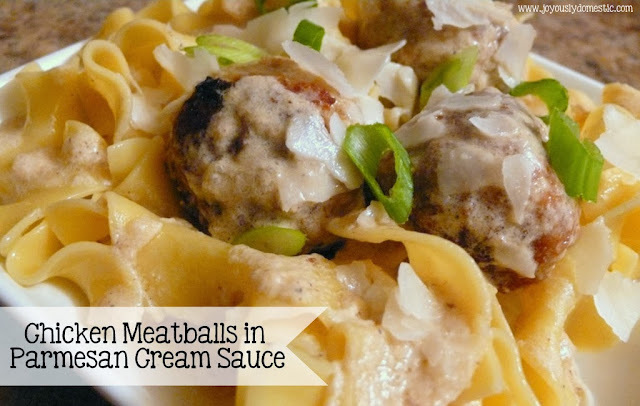 Combine all of the meatball ingredients into a mixing bowl. I "wear" a plastic sandwich bag over my hand to combine. Then, just remove and toss! Do not overmix or your meatballs will be tough. Wet hands with some water and roll out meatball mixture into balls. This is now the time you would lay them out individually on a cookie sheet and place tray in the freezer if you're making these ahead of time to freeze. When they are completely frozen, throw them into a large freezer bag, let the air out, seal, label and freeze until a few hours before using (or thaw in fridge the night before cooking). When ready to prepare meal, brown meatballs on all sides in large saute pan over medium-high heat in olive oil. You may have to do this in batches so you don't "crowd" the pan. Remove meatballs when browned, place on a plate and set aside. In the same pan, sauté the finely minced onion on medium heat just until translucent. Sprinkle onions with flour, stir and cook for a few minutes. Then, whisk in the chicken stock or broth until no lumps remain. Whisk in the heavy cream (or milk if that's all you have). Turn heat down to low. Sauce should barely be simmering. Stir in about 3/4 of a cup of shaved parmesan and a good pinch of black pepper. Check for seasoning. Add salt if it needs it (parmesan is pretty salty). Place meatballs into the simmering cream sauce and simmer for 10 - 15 minutes or until meatballs are cooked through and sauce has thickened (take out one meatball and test for doneness). Serve over prepared egg noodles or over mashed potatoes, if desired. Garnish with a little more shaved parmesan and some sliced green onions. NOTE: Ground turkey or ground beef can be used in place in ground chicken. Can not wait to try this. LOve the freeze option. Thanks so much for sharing. We loved the meatballs and will definitely be adding to our regular rotation! So glad to hear that! And, thanks for stopping back by to update! Just discovered your blog today; I'm your newest fan! These meatballs look delicious. Can't wait to try them. Hello. I made the meatballs and sauce yesterday and though I liked the end result, I thought the meatballs tasted more like the bread crumbs,thus masking the delicate flavor of the chicken. I think when I make this recipe again, I will cut the crumbs to 1/4 cup as 3/4 cup seemed too much. I always season liberally, so that was not the issue. I also added 2 cloves of pressed garlic and some fresh parsley to the meatball mixture, since my herb garden has an abundance of it. The sauce was delicious and I added a touch of chopped parsley to that as well. I used Panko unseasoned bread crumbs, since that was all that I had. Thank you for the recipe; I will be making it again. So glad you enjoyed the recipe, but sorry that you had issues with the bread crumbs "taking over." Possibly it was from using panko, but I'm not quite sure. :) Lessening the amount next time would be fine, I'm sure. (Isn't that the great thing about recipes ... we can adapt them to our own liking.) Love the addition of the fresh herbs! :) Thanks for visiting and leaving feedback. Wow~ it's tasty! I can't wait to try this recipe. This gonna make my lunch better.